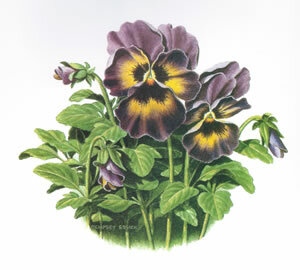 "Pansy Faces: A Pair of Prints"
Pansies exist to be pretty. In all their various combinations of color, their appeal is their lifeblood. 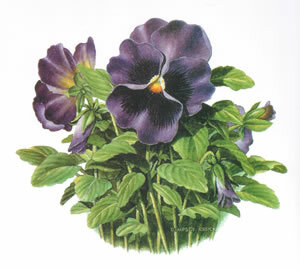 Pansy lovers willingly replant each spring just so they can be cheered each time they pass by a planter or flower bed. For the artist, capturing the richness of the colors as well as blending of dark to light can be extremely difficult but Dempsey has mastered it as seen here in the pair of prints. His blossoms are so true to life that viewers sometimes mistake them for dried and pressed flowers. Dempsey usually has pansies growing by the doorway to his shop and frequently includes them in his masterful paintings. Best of all Dempsey’s pansies do not fade at summer’s end but can be enjoyed even as the snow flies. Note: This pair is a perfect accent to “Salem Bouquet”, “Cled’s Crock”, and “Carolina Heritage”.